The Miami Trace Panthers wrestling team at Chillicothe High School after winning the Frontier Athletic Conference tournament and the FAC championship for the second year in a row Saturday, Feb. 9, 2019. 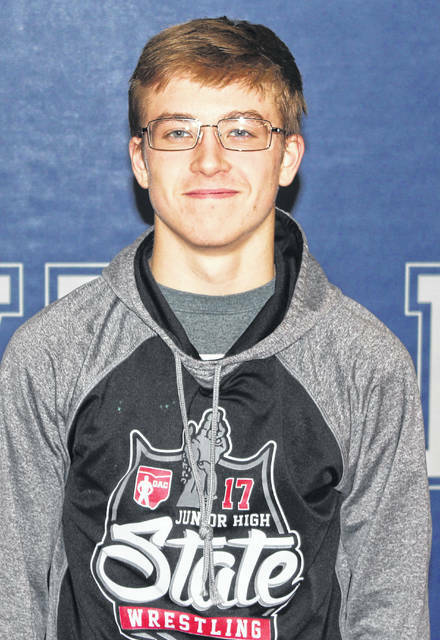 Miami Trace senior James Munro, a State-qualifier a year ago, won the FAC 160-pound championship at Chillicothe High School Saturday, Feb. 9, 2019. Above, Munro competes against Cade Williams of Chillicothe. Washington’s Kalub Wilkerson wrestles Dominic Nunziato of Chillicothe at 152 pounds during the FAC tournament at CHS Saturday, Feb. 9, 2019. Wilkerson placed second in his weight class. Miami Trace sophomore Graham Carson lifts Jackson’s Ty Jones during a 132-pound match at the Frontier Athletic Conference tournament Saturday, Feb. 9, 2019 at Chillicothe High School. Carson went on to win this weight class title. Washington’s Mason Mustain (right) wrestles Luke Anders of Miami Trace in a 220-pound match at the FAC tournament Saturday, Feb. 9, 2019. Mustain was the weight class runner-up at 220 pounds. Washington Blue Lion senior Jay Fettig wrestles Gabe Kisor of Jackson during the FAC tournament Saturday, Feb. 9, 2019. Fettig placed third at 160 pounds. 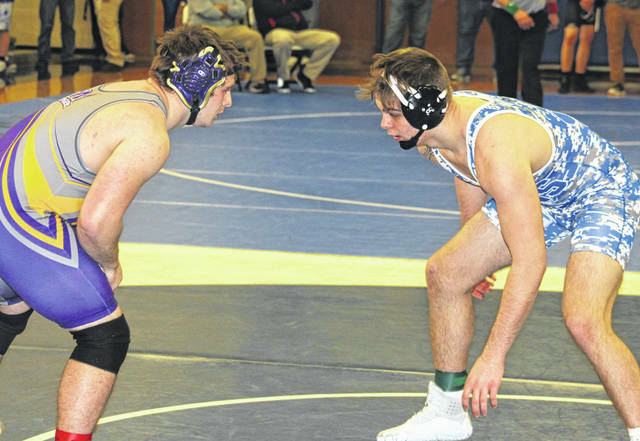 Washington junior Collier Brown (at right) faces Kyler Trefz of McClain in a 195-pound match at the FAC tournament Saturday, Feb. 9, 2019. Brown placed second in the conference. Miami Trace freshman Jayden LeBeau won the 145-pound FAC championship with a pin of McClain’s Quinton Smith Saturday, Feb. 9, 2019. Blue Lion freshman Jacob Stone has the advantage over Kannan Ransdall of Chillicothe at 106 pounds at the Frontier Athletic Conference tournament Saturday, Feb. 9, 2019 at CHS. Stone finished second at the tournament. Washington freshman Branton Dawes won the 113-pound weight class championship in the FAC, spending only 27 seconds on the mat with a pair of quick pins Saturday, Feb. 9, 2019. 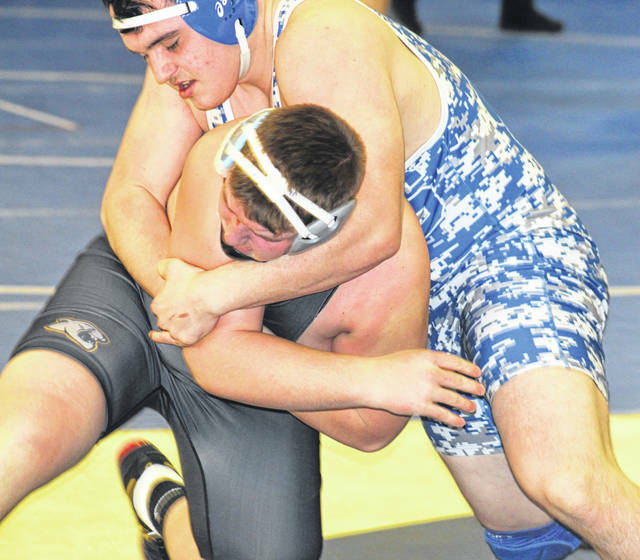 CHILLICOTHE — The Miami Trace Panthers came into the Frontier Athletic Conference wrestling tournament in first place, having swept their five dual meets during the regular season. The Washington Blue Lions entered the tournament in fourth place and placed second to improve to a three-way tie for second place with McClain and Jackson. Chillicothe was sixth coming in and placed fifth at the tournament to raise their final placing to a tie for fifth. Hillsboro began the day in fifth place, but placed sixth at the meet to finish tied with the Cavaliers for fifth. The Panthers had six conference champions. Freshman Weston Melvin won the 106-pound weight class with a pin of Haden Dixon of Jackson in 1:05. In the championship match, Melvin pinned Jacob Stone of Washington in 1:26. Storm Duffy won the 126-pound weight class. Duffy advanced with a forfeit by Hillsboro and a pin of Caleb Lake of Chillicothe in 5:21. At 132 pounds, sophomore Graham Carson won the title with a pin in 3:05 over Ty Jones of Jackson and a 16-7 major decision over Dawson Jansen of McClain. Sophomore Mcale Callahan won the 138-pound championship with a pin in 15 seconds of Washington’s Jordan Rohrer and a pin of McClain’s Jacob Krafthefer in 1:14. Freshman Jayden LeBeau won the FAC title at 145 pounds with a pin of Jackson’s Joey Richison in 5:28 and a pin of Quinton Smith of McClain in 4:27. State-qualifier from 2018, senior James Munro, won the conference title at 160 pounds. He pinned Cade Williams of Chillicothe in 2:39 in the semifinals and then pinned Richard Adkins of Hillsboro in the finals in 1:28. The Washington Blue Lions had one weight class champion, freshman Branton Dawes at 113 pounds. Dawes pinned Titus Lehr of Miami Trace in 14 seconds and Gavin Malone of Jackson in 13 seconds to win that weight class. Junior heavyweight Grant DeBruin won a major decision (10-2) over junior Chase Sluder of Washington and then was pinned by State-qualifier Lane Cluff, Hillsboro senior, in 3:02 to place second. 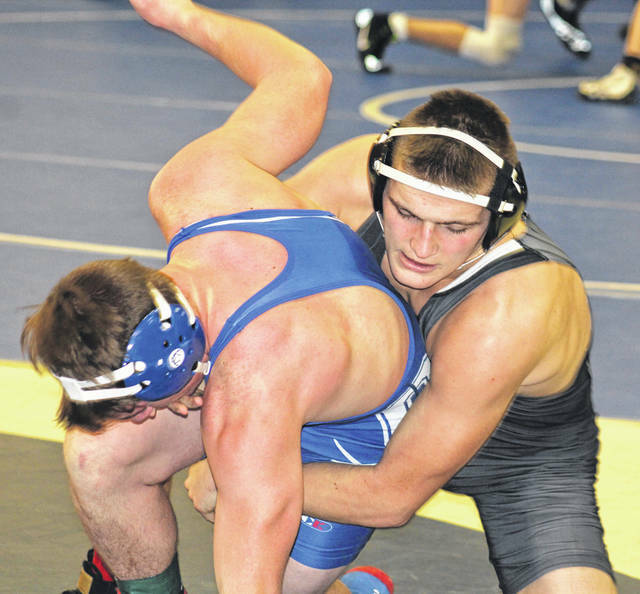 The Blue Lions had four wrestlers place second at the FAC meet. Freshman Jacob Stone was second at 106 pounds. He won a 6-1 decision over Kannan Ransdall of Chillicothe in the semifinals and was then pinned by Weston Melvin of Miami Trace in the finals in 1:26. Junior Kalub Wilkerson was second at 152 pounds. He won his first match over Dominic Nunziato of Chillicothe by pin in 27 seconds. He lost in the finals to Brennen Greene of Jackson, 6-2. Junior Collier Brown (195) won a 5-2 decision over Garret Fannin of Hillsboro and then a 6-2 decision against Kyler Trefz of McClain. In the finals, Brown lost a 5-2 decision to Nick Erslan of Chillicothe. Freshman Mason Mustain (220) won a 15-0 technical fall over Miami Trace’s Luke Anders and then lost a 4-2 decision in the finals to Kade Rawlins of McClain. “We had a rough first round,” Miami Trace head coach Ben Fondale said. “So we brought the kids in and talked to them a little bit. “That finals round and the consolation finals round, that was probably the best we’ve wrestled all year,” Fondale said. “The kids really turned it up in the last round. “A couple of notable wins were Storm Duffy came back from being down,” Fondale said. “He’s done that a couple of times this year, where he was losing early and wrestled all the way through the third period to win the match. “Graham Carson had a pretty big win for us,” Fondale said. “Some of our upper-classmen really stepped up and we expected them to. Dawson Wallace got a pin for third place (over Nunziato in 1:21). Miami Trace did have a large contingent of fans at the meet, taking up the better part of one side of the lower part of the gym at CHS. The Blue Lions didn’t quite get the result they were looking for as far as numbers of FAC champs, but they did move up into the above-mentioned tie for second place. “We’re a little disappointed,” Washington head coach Louis Reid said. “We thought we could have as many as five league champs and we ended up with one league champ. “We do have a (First Team) All-FAC (Dawes), I’m happy with that,” Reid said. “Overall, we wrestled a lot better. A lot better. We had some guys defeat guys they had lost to early in the season. As a team, coming into this, we were sitting in fourth place in the dual (meet) portion of it. And we managed to finish tied for second. “I’m happy with our overall team performance,” Reid said. Next up will be the Division II Sectional, which the Blue Lions will hold Feb. 22 and 23. The top four in each weight class advance to the District tournament, set for March 1 and 2 at Wilmington High School. “We’ll get back in the practice room,” Reid said. “We’ll work hard. We’ll get prepared for the postseason. Our guys have been working really hard. I’ve really been proud of the effort and it shows on the mat. If we continue to work as hard as we do, we’re going to peak in the postseason. “That’s what it ultimately is about,” Reid said about the upcoming tournament run toward State. “When Sectionals come around, everyone’s record is 0-0. The only thing that matters is what you do at the Sectionals, District and State. Anything can happen. We’ve had some kids that had losing records last year that ended up moving on in the postseason. “If we keep working hard, I’m sure we’ll have several moving on in the postseason,” Reid said.